The air, the water, the food and the surfaces around us are populated with microorganisms. Some are quite harmless, some are useful, and a percentage of them are quite dangerous. The latter group can cause serious illnesses that can damage our body, from simple colds to food poisonings. But thankfully, most people do not get sick easily. They have several defensive barriers in place. Besides those barriers, there is a complex defensive system that actively destroys potentially harmful organisms through several mechanisms. It is called the immune system. Let us imagine there is a nasty microorganism outside that really wants to get inside our body. There are so many cells that can be invaded and used to its advantage, and our blood has all kinds of nutrients that a parasite would just die for. But in order to reach those treasures of ours, it has to get in first. And it is not that easy. Even before encountering the immune system, it has to overcome the passive barriers present. Look at yourself in the mirror. Our whole body is covered with a complex structure called the skin. It has multiple layers and is very hard to penetrate. You need a special instrument to break the skin – for example a proboscis of a mosquito, a claw, or a sting. Then the microorganisms can potentially invade. Our face has several potential entry points for pathogens. The mouth and the eye can be typical examples. The eye is a very complex structure, and some of its most delicate components are constantly exposed to the outside – in order for us to see. And the mouth is, obviously, a place where the food enters. And with food, any kind of microorganisms can enter as well. But there is a solution! In areas where the body cannot form thick barriers – it uses chemistry. Our tears and our saliva have a special enzyme that can kill bacteria very effectively. It is called lysozyme. Our saliva also contains digestive enzymes that can both help digest the food and the bacteria it can potentially contain. If you cannot destroy them – detain them. This approach is very effectively used in our noses and our ears. The mucous tissues in our noses produce a complex substance called mucus. It surrounds the dust and the potential pathogens and then we can eliminate them all when we sneeze. The cells in our ears use similar approach – they produce earwax. It also surrounds all foreign objects and then all of them can be easily eliminated. Even if a microorganism has survived the tough environment of our mouths, it can potentially be destroyed later. When we digest food, the stomach is filled with extremely active acid. Most microorganisms cannot survive it. But despite those effective mechanical and chemical barriers, the pathogens still get into our bodies. They have different ways to overcome our walls. And that is where the second line of defense is waiting for them – our immune system. As you can see, immune cells not only destroy any potential foreign organisms, they also support the integrity of the body – the homeostasis. 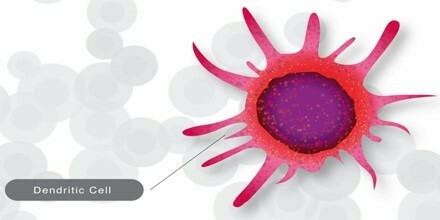 Our immune cells are also called white blood cells. There are several types of immune cells and all of them are produced in the bone marrow from special stem cells. These cells are also called hematopoetic, as they are the starting point of production of all cells in the blood – red blood cells and white blood cells. 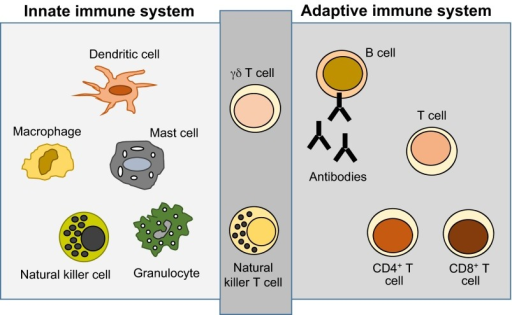 Though there are multiple types of immune cells, they can be grouped into two major divisions depending on the way when and how they respond to the invasion: there are innate immunity cells and adaptive immunity cells. Macrophages and neutrophils are phagocytic cells. After they identify the intruder, they surround it and use special enzymes and hydrogen peroxide to destroy it. This process is called phagocytosis. Dendritic cells, in their turn, are not warriors. But they are very important as well. They are taking up pieces of the invading bacteria or viruses and push them up to their cellular membranes, so the receptors of other cells can interact with them. This process is called antigen presenting. Anything can be an antigen – a foreign molecule, a molecule of the body itself, or even a whole pathogen such as a virus. And it is important to “present” it to other cells because of a very interesting mechanism our immune system has. You see, the innate immune cells are only interested if the object they meet is foreign or not. They only differentiate “self” from “non-self”. They are non – specific. But the cells of adaptive immunity know exactly who they are dealing with. The cells of adaptive immunity system are called lymphocytes. There are two main types of lymphocytes. Each type mounts their own specific defense against the invading enemy. If a dendritic cell brings its piece of an antigen to a T-lymphocyte, or a T-cell, it would start a cellular immunity response. T-cells have specific receptors on their surfaces. Each particular T – cell has receptors for parts of a specific bacterium, virus or other agent. So when a dendritic cell shows its antigen, T-cells with suitable receptors flock to the area of infection. Then they destroy the bacteria or infected cells in question. If our antigen presenting cell would go another type of lymphocyte called the B-lymphocyte or a B-cell, it would trigger humoral immunity response. B-cells do not kill directly. They produce specific proteins that can tightly stick to the pathogen – antibodies. Again, there are specific antibodies that react only with specific organisms. They are not universal. When the organism is “marked” with antibodies, it is much easier to kill and destroy. What is great about adaptive immunity is the fact that if they ever encounter a particular agent of infection, they would remember it. And if it tries to invade again, they will mount the defense twice as rapidly and quickly clear it away. That is why we say that we have immunity to rubella or chickenpox – once we had this particular disease, the information gets written down by our immune cells. And next time, they would easily eliminate the same virus. This same principle is behind vaccinations. 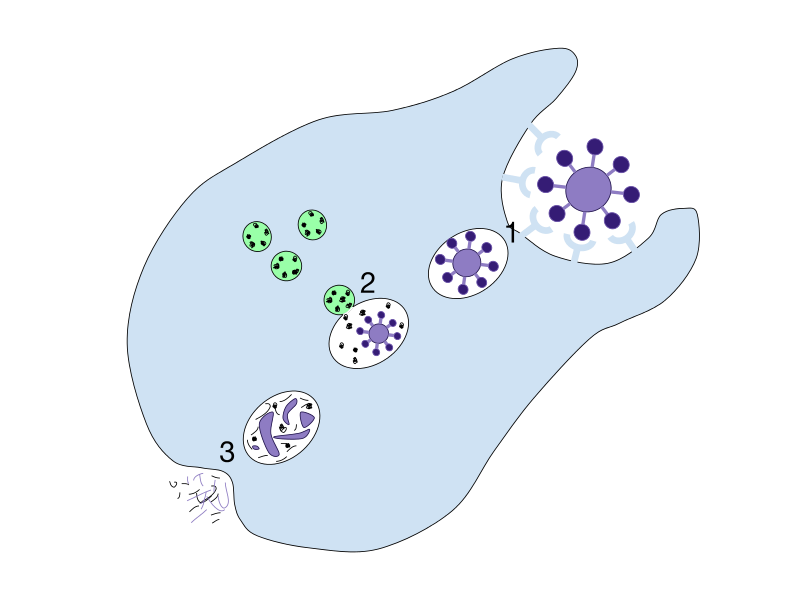 A vaccine contains parts of certain viruses and bacteria. They are weak enough not to cause a real illness, but foreign enough to force our immune cells to produce antibodies to them. And when we actually encounter the infection, we either would not have it at all, or we would have only a mild illness, not a full-blown one with lots of complications. Thankfully, our body is not that easy to destroy. But we also should remember that by supporting it in any way we can – eating nourishing meals, keeping clean and fit – we help it defend itself better. [4.] Janeway, C. A. et al. (2001) Immunobiology: The Immune System in Health and Disease. 5th edition. New York. Garland Science, 2001.